“It was my duty to make known to others, in a public manner, the great truths I had learned.” —J. N. Loughborough. John Byington: First General Conference President, Circuit-Riding Preacher, and Radical Reformer. Brian E. Strayer, PhD, served as a counselor at Camp Cherokee in New York's Adirondack Mountains a few miles southeast of John Byington's farm. 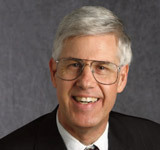 A retired professor emeritus of history at Andrews University, Dr. Strayer enjoys writing about Adventist history and leading Adventist heritage tours of New England, New York, and the Midwest.